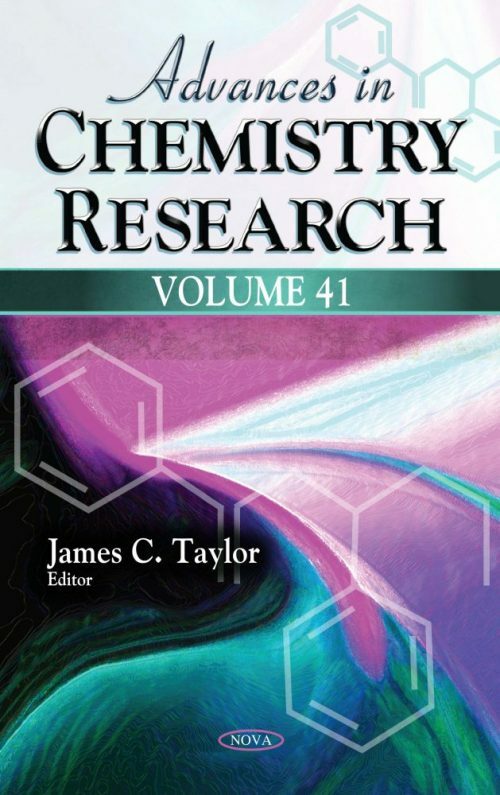 In this volume of Advances in Chemistry Research. Volume 41, the opening chapter proposes that the use of accessible N-alkyl-2-haloaldimines Me2C(Hlg)CH=NR1 (Hlg = Cl (1), Br (2)) in the imine version of the Pudovik reaction with acidic esters of phosphorus acids vastly extends its synthetic potential due to the fact that a primary addition or protonation product, having mobile single halogen atoms, can undergo spontaneous transformations as well as transformations involving other reagents. The authors go on to maintain that speedy detection and isolation of various lectin types is required for diagnosis and therapeutics, thus resulting in the development of an effective method of preparation of lectin specific nanogold (silver)-labeled colloidal, and cross-linked neoglycoconjugates, based on maleic anhydride copolymers. The authors go on to discuss the various methods available for the splitting of racemates into separate enantiomers, based mainly on stereoselective chromatographic analysis (HPLC, GC, CE, TLC, etc.) or on the classical method of separating the enantiomers by crystallization of their diastereomeric salts. Another chapter examines the biomimetic sol-gel synthesis of silicon-chitosan-containing glycerohydrogels with the use of silicon tetraglycerolate (precursor) and chitosan salts (templates), namely, chitosan acetate, lactate, ascorbate, hydrochloride, hydrochloride-ascorbate and hydrochloride-glycolate, as well as examining the effect of the concentrations of the precursor, chitosan salt and a low-molecular-weight accelerator, estimating the pH of the medium and temperature (4–80°C) of the sol-gel process on the gelation duration in multicomponent chitosan-containing systems. The authors propose an economically efficient and ecologically friendly means of plasmid DNA metallization, with the potential for the obtained plasmid to be investigated for vaccine adjuvant and antitumor agent properties. This volume also discusses the establishment of a linear regression, taking into account the errors in measurement of an explanatory (independent) variable. The authors suggest that the use of an error-independent “instrumental” variable correlated with the explanatory variable and inverse least-squares-based are two means for arriving at consistent parameter estimates.